Studio provides a unified suite of tools and services for all participants in the video ecosystem. Built from the ground up in the cloud, Studio brings internet dynamics and economics to video management and distribution. Frequency Studio includes a complete content management system for content owners and rights holders. Underlying the platform are Frequency's metadata and intelligence engines that manage the complex relationships between content and viewers. Our modern take on managing the video pipeline is based on workflows, letting you do everything in one place, seamlessly transitioning between functions and tasks. 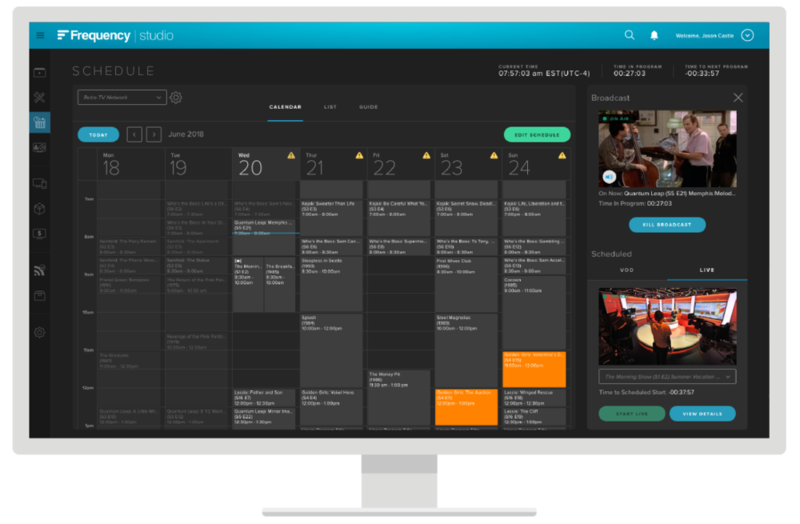 Create a 24x7 linear channel – including scheduled and on-the-fly switching to live streams – with Frequency Studio's linear scheduling and playout system. We have created simple but powerful tools that power next-generation broadcast networks. Video platform operators have access to visual layout tools let you update your consumer experiences in real-time. Curate manually, or automate your workflow with dynamic playlists. Content providers can manage all distribution endpoints from one centralized location. Deliver your VOD content via an MRSS feed, or your 24x7 linear channel to any operator platform. Frequency supports dynamic video advertising. We integrate with the advertising systems of our content providers and our video platform operators. We look forward to speaking with you about your business and discussing how Frequency Studio can help power your next generation content experiences.